Before Lion (OS X 10.7) debuted last year, installing the latest major version of Mac OS X meant buying a disc and slipping it into your Mac’s optical drive. But Lion changed all that by making OS X available for direct download. OS X 10.8—better known as Mountain Lion—inherits Lion’s distribution method. More specifically, it’s available only as a download from Apple’s Mac App Store. This makes it easier and more convenient to upgrade your OS than having to buy and use a DVD or thumb drive, but it also raises a number of questions, and it presents upgrade obstacles for some users. As I did last year with Lion, I’ve compiled this guide to getting and installing Apple’s latest OS. Before proceeding, be sure to read my article on getting your Mac ready for Mountain Lion, which covers system requirements and recommendations, as well as a number of tasks you should perform before upgrading that will help make the process go smoothly. Fair warning: If you install Mountain Lion right when it’s released, keep in mind that you’re installing version 1.0 of a major new OS. It could be bug-free, but if the history of OS X is any indication, we’ll see the first update, containing a number of bug fixes, within a few weeks. If downtime isn’t an option for you, you might consider holding off for OS X 10.8.1. You purchase Mountain Lion through the Mac App Store app. Assuming you meet the requirements, getting Mountain Lion is easy—for most people (more on that below). 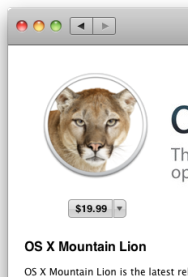 You simply launch the Mac App Store application, click the OS X Mountain Lion banner on the store’s main page (or search for Mountain Lion, or click this direct link), click the $19.99 button at the top of the screen, then click the Buy App button that appears. After providing your Apple ID and password, Mountain Lion will begin downloading. Specifically, the 4.4GB installer application, called Install OS X Mountain Lion.app, will be saved to your main Applications folder (/Applications) and, if you’re upgrading from Lion, added to Launchpad. On my Mac, the installer even automatically launched after it finished downloading. On cable-model connections around the U.S. the morning of Mountain Lion's release, the download took between 35 and 55 minutes for Macworld editors. Note that unlike with Lion, which continued to use the legacy Software Update feature (found in the Apple Menu) to provide OS updates, updates to Mountain Lion will be provided through the Mac App Store app. In fact, if you choose Software Update from the Apple Menu under Mountain Lion, the Mac App Store app is launched. Downloading the installer onto other Macs: Once you’ve purchased Mountain Lion, you can download the installer onto any 10.8-capable Mac authorized to use your Mac App Store account—just like applications purchased from the store, a single purchase of Mountain Lion lets you install it on all your personal Macs. To download the installer on a Mac other than the one on which you purchased it, you just launch the Mac App Store application, click the Purchases button in the toolbar, and click the Download button next to OS X Mountain Lion in the list. Copying the Mountain Lion installer onto other Macs: Alternatively, once you’ve downloaded the Mountain Lion installer onto one computer, you can copy it—over your local network or by using a flash drive, DVD, or external hard drive—to your other Macs. This is obviously a much faster approach than re-downloading the 4.4GB installer onto each of your Macs. You won’t even be prompted to authorize the installer on each Mac, as you are with other Mac App Store-distributed software—the Mountain Lion installer does not use digital-rights management (DRM). Downloading the installer onto a Mac already running Mountain Lion: If you already have Mountain Lion—either the official release or the golden master (the final developer release, a.k.a., the GM)—installed on a Mac, you may have problems downloading the installer onto that Mac, as the Mac App Store app may think you already have it and, thus, not offer to let you download it. (This was a common issue with Lion, although in our experience the day of Mountain Lion’s release, several Macworld editors were able to download Mountain Lion without hassle onto Macs running Mountain Lion.) If this happens to you, launch the Mac App Store app and Option+click the Purchases tab in the toolbar; that should show the Download button next to Mountain Lion in the Purchases list. If that doesn’t work, Option+click Mountain Lion in the list and then Option+click the Installed button on the Mountain Lion page. One of these two methods should let you download the installer. Similarly, if you're a developer who previously downloaded the "golden master" (GM) of the Mountain Lion installer, the Mac App Store app may claim Mountain Lion is "Installed" on your Mac—and thus not let you download the official release—if the Mac App Store app detects that installer on any connected volume. (Again, this happened frequently with the Lion installer, but in my testing so far, hasn’t been a problem with Mountain Lion.) If this happens to you, the solution is either to delete the GM installer (after compressing it or copying it to a removable drive if you want to keep it handy) or, if possible, to disconnect the drive on which the GM resides. Before proceeding, here’s an important tip: If you run the installer from its default location in the Applications folder, the installation process deletes the installer, presumably to free up the over 4GB of drive space it occupies. So if, as explained above, you plan to use the installer on other Macs, or if you just want to keep the installer on hand, before installing you should copy the installer to another drive—or at least move it out of the Applications folder. Like Lion—and unlike earlier versions of OS X—Mountain Lion offers only a single installation option: where to install the new OS. In fact, you don’t need to make any decisions until it’s time to set things up and start using your Mac. 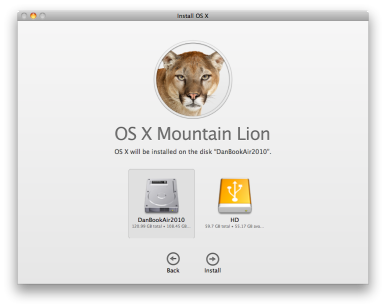 You don’t even need to boot from a different disc or volume—the Mountain Lion installer runs as a standard application. Double-click the Install OS X Mountain Lion app; in the window that appears, click Continue, and then click Agree to agree to the software license agreement. The installer will spend some time preparing for installation; over many test installations on several different Mac models, this process rarely took more than a few minutes. You'll see a message in the installer window that your computer will restart automatically; you can continue to work in other applications during this time, but once the preparation phase is finished, you’ll get only a 30-second warning, and then your Mac will indeed restart on its own. That’s it—unlike older OS X installers, Mountain Lion's doesn't make you decide what kind of installation you want to do, which language translations or printer drivers to install, or whether or not you’ll ever use X11 or QuickTime 7. The installation procedure is easier and quicker than ever. When the installation procedure finishes, what you’ll see depends on whether you’ve installed Mountain Lion on a blank drive, or if you’ve installed it on a drive containing Lion or Snow Leopard with existing accounts, settings, and data. Lion: If you’ve upgraded from Lion (or installed 10.8 onto a blank drive and imported your Lion data and settings), the first thing you’ll see when you log in to your account under Mountain Lion depends on whether or not you were already using iCloud under Lion. If you were, and if Location Services and Find My Mac were previously enabled, there’s a good chance you’ll be able to get right to work with no further interruptions. If didn’t already have iCloud configured under Lion, or if you did but Location Services and Find My Mac weren’t enabled, your initial experience will be much like the one I describe for Snow Leopard upgraders in the next paragraph. Snow Leopard: If you’ve upgraded from Snow Leopard (or installed 10.8 onto a blank drive and imported your Snow Leopard data and settings), the first thing you’ll see when you log in to your account under Mountain Lion is an Apple ID screen. Enter your Apple ID and password—you can create an Apple ID if you don’t have one—and agree to the Apple ID Terms and Conditions, and you’ll then be prompted to set up iCloud. Assuming you want to do so, click Continue (twice). You’ll then be prompted to enable Find My Mac using your iCloud account; if you choose to do so, you must also allow Location Services. Finally, you’ll see a Thank You screen with a button to Start Using Your Mac. 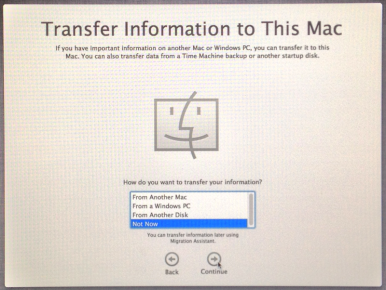 After installing Mountain Lion on a blank drive, you can transfer your data from another Mac, a Windows PC, another hard drive, or a Time Machine backup. Blank drive: If you installed Mountain Lion onto a blank drive, you’ll be walked through the new-system setup procedure. First you’ll choose a system language and keyboard layout. Next, you’ll choose a Wi-Fi network and provide the network password. (Click Other Network Options to use Ethernet instead.) 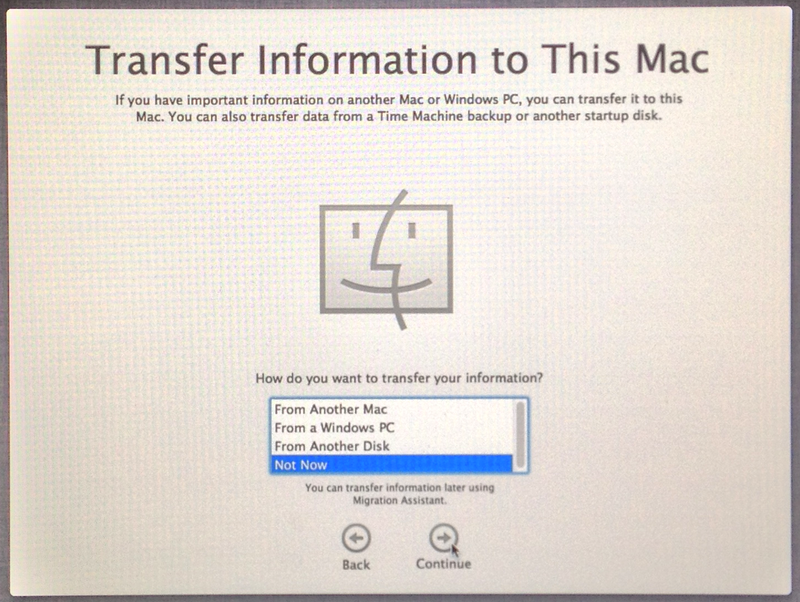 You’ll then be asked if you want to transfer accounts and data from another Mac, a Windows PC, or another drive (which includes a Time Machine backup or a clone backup). If you choose to do so, you’ll be given the option to choose what to transfer—unless you really want to start anew, you’ll probably want to transfer everything. If you opt to transfer accounts and settings from a Snow Leopard or Lion Mac or drive, the setup procedure will continue much as if you upgraded from Snow Leopard or Lion, respectively. If you choose not to transfer—so you’re essentially starting fresh—you’ll be asked to enable Location Services, to provide your Apple ID and password (and to agree to the Apple ID terms and conditions), to set up iCloud, and (assuming you enabled iCloud) to enable Find My Mac and allow it to use your location. You’ll then need to create a user account and password, as well as to configure a few options for that account. After that, you’ll set your time zone and choose whether or not to register your Mac. Finally, you’ll then see the aforementioned Thank You screen—click Start Using Your Mac to proceed. 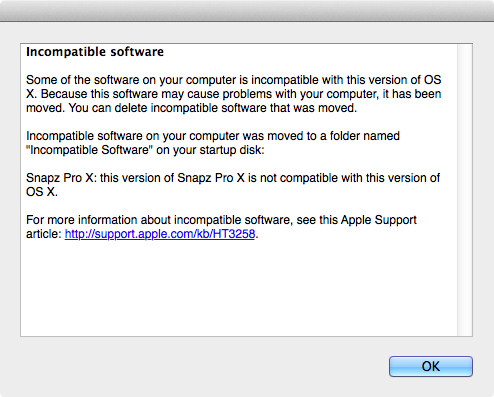 The first time you boot into Mountain Lion, you may be alerted to known incompatible software.